Only 16% of all hornbill species are classified as being under some level of threat, ranging in increasing degree from Vulnerable to Critical and Endangered, according to the IUCN. An additional 12 species, however, are considered Near Threatened and will probably experience a decline in status within the twenty-first century. Africa presently has no hornbills in danger of extinction; only two West African forest inhabitants, the yellow-casqued hornbill (Ceratogymna elata) and the brown-cheeked hornbill (Bycanistes cyHndricus), are classified as Near Threatened. All nine species suffering endangerment reside in Asia, and most (77%) occur on small oceanic islands. The Sumba and Narcondam hornbills, both single-island endemics, are classified as Vulnerable, with total populations hovering around 4,000 and 300, respectively. The situation in the Philippines is especially urgent. Rapidly dwindling forests contain two species ranked as the most endangered hornbills in the world, the Visayan and Mindoro tarictic hornbills, as well as two species classified as Critical, the Sulu (Anthracoceros montani) and rufous-headed (Aceros waldeni) hornbills, and one Vulnerable species, the Palawan hornbill (Anthracoceros marchei). There are no rigorous population estimates for these species, but we assume populations are extremely small and may vanish within decades unless conservation measures are adopted. The underlying threat to hornbill populations is habitat alteration resulting in forest loss and fragmentation. As forests become smaller and more isolated, hornbill populations decline, resulting in increased vulnerability to extinction from natural disasters such as disease. Protection of hornbill populations and their habitats within conservation areas of adequate size offer some hope for their long-term persistence. 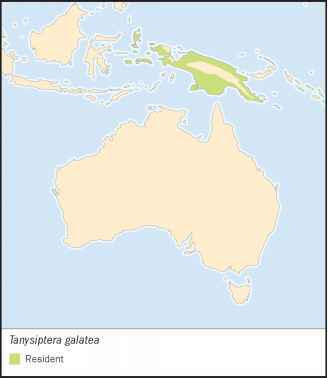 In the late 1990s, two parks were established on Sumba to aid in the conservation of the Sumba hornbill, and the Philippines have proposed to establish the Central Panay Mountains National Park (NP) for the Visayan tarictic hornbill. In India and Africa, vast tracts of savanna and forest have been protected as parks for decades. The long-term success of hornbill conservation in these parks, however, depends on active management to ensure that they are more than "parks on paper." Unsustainable hunting for food, pets, and body parts is also a problem. Although illegal, trade in helmeted hornbill ivory continues. Great and oriental pied hornbill casques are common souvenirs in Thai and Laotian markets. Traditions that require feathers or skulls take a toll on living birds. Female Kenyalang dancers of Malaysia carry up to 10 hornbill tail feathers in each hand, thus supplying a full complement of 20 dancers can cost up to 80 hornbills. 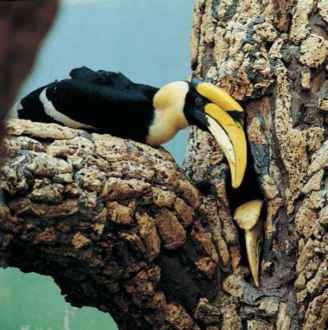 The 1990s have seen a dramatic increase in awareness of hornbill ecology and conservation needs. The number of hornbill studies, especially those by range-country biologists, escalated during this time and continues to increase. Developments in hornbill research and conservation are quickly communicated to the global community through the IUCN Species Survival Commission's Hornbill Specialist Group and facilitated by Internet communication. Only with such global attention are we able to finance local initiatives and put pressure on a range of state governments to conserve these unusual birds.